This a movie review of THE ARBOR. Who would have guessed that a documentary would’ve made my Top 10 favourite films of 2010? It is too seldom indeed. THE ARBOR joins the likes of CAPTURING FRIEDMANS and TAXI TO THE DARK SIDE, which really made an impact on me. We are in Bradford, West Yorkshire (England, for international readers), and this picture is primarily about two women, playwright Andrea Dunbar and her eldest daughter Lorraine. THE ARBOR was her debut play. Instead of the usual talking heads or archive footage, these two women’s lives are portrayed primarily using actors lip-synching their own recorded words (along with those in their circles). 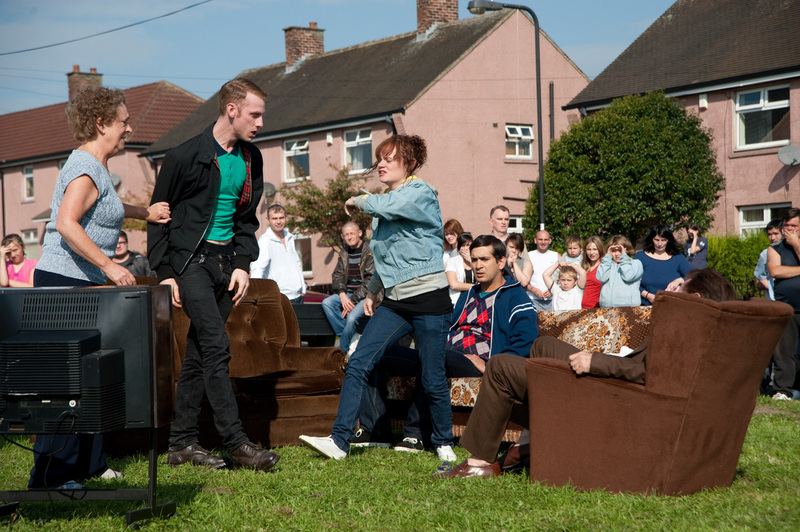 Not only is that a rarely used cinematic device (seeming to reflect theatre director Max Stafford-Clark’s own staging of verbatim theatre piece 'A State Affair'), but the plays themselves (including a performance outside on a council estate with residents looking on), and surreal imagery (a bed on fire while actors talk to camera), combine to create a gripping dissection of these ladies; where style meets substance. Don’t also think because Dunbar’s family and colleagues are involved that this is some anodyne hagiography. It is not a flattering portrait; there is admiration for her writing talent, but also deep concern at her parenting and inner demons. The hardship that Lorraine in particular suffers is distressing. The tone is melancholy without being kitchen sink. I kept thinking while watching, this is so well made – the acting, mise en scène and lighting; which all rightly go to complimenting the (moving and frank) testimony. I cannot recommend this highly enough.